Our core service is to provide First aid training and care. We have highly skilled and qualified trainers who provide quality training to commercial enterprises as well as charity trainings to communities. In a period of less than 10 years, we trained over 20,000 people country wide and the figure is expected to proliferate over the years. Our First training in our divisions have been very beneficial to all communities and we are able to mobilise our members whenever need arises. First aid training now stretches from corporate bodies to individuals in rural areas where medical help is impossible, such medical knowledge instilled in community members throughout the country is what has made a difference in the country. 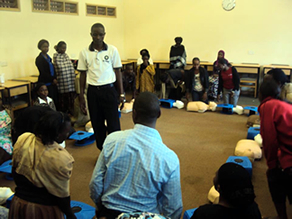 First aid training in Uganda has over the years ranged from cadets, badgers up to the elderly members of the society which has stimulated the concept of saving lives in every person who under goes our First aid training. First aid in Uganda has served to preserve the lives of many Ugandans than any other form of medical treatment given the rampant cases of accidents, sicknesses, disasters such as floods, Earthquakes and other life threatening situations.